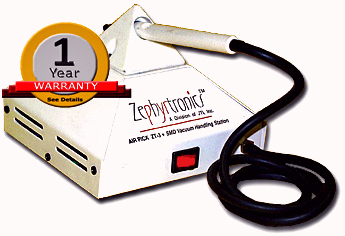 Zephyrtronics Equipment is Engineered and, Yes, Manufactured in the United States of America! Premium SMD, BGA, Wafer & Tiny Component Vacuum Lifting & Handling System! 24 Years on the Market! The ZT-3 AirPick™ is your all-purpose vacuum handling system for miniature SMD’s, BGA's, µBGA's including tiny 0201’s, 0402’s, 0603’s and 0805’s and ideal at handling semiconductors, wafers and small, flat surfaced objects like plain and siliconized cover slides, plastic and glass slides. And the ZT-3 is the ideal tool for handling solder spheres during re-balling BGA's. 1 Year Warranty! The ZT-3 has its own internal long-life diaphragm vacuum pump for “continuous vacuum” supply. ESD-Safe with a 1-year limited warranty!. And in our trademark pyramidal recognizable design!. Perfect Suction! The technical "spec" for is inches of mercury with an open air flow of about 2 full liters per minute. No Buttons to Press! Let's be brutally honest: Nothing is more awkward or complicates lifting and handling tiny parts or chips if one also has an extra step of eye/hand co-ordination with pushing a button or squeezing a bulb to start or release the suction. The ZT-3 eliminates all of that with no need for finger pressure or button pressing! So helpful when working with microscopes. Just so superior And, of course, this reduces hand fatigue. Quick Release! ZT-3 releases parts without residual vacuum problems which is a common complaint with vacuum pens that won't let go of parts and can require shaking them off. The ZT-3 always releases the chip! The ZT-3 has a lighted power switch, a 3-wire power cord, seven ESD safe suction cups, non-skid rubber feet and a very slim-line, featherweight hand-piece! Each ZT-3 AirPick™ is factory calibrated balancing the need for lifting the largest of SMD’s and chips, without excessive suction which can lift pads. This is critically important for those who rework with LowMelt®. 2 of 1/8", 2 of 1/4", 1 of 3/8", 1 of 1/2"
A Centered Holder for the Pencil: Engineered with the technician in mind, the ZT-3Air Pick™ features a holder integrated right into the center of the design (for right or left handed users) helping protect and extend the life of delicate suction cups during the rigors of work activity. How thoughtful is that? Oh, and Made in the USA. New! Ultra Tiny Vacuum Tips. 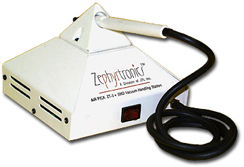 Zephyrtronics has expanded our line of suction cups to now include our new line of tips for handling microscopic parts. (Scroll down for more info.) The ZT-3 expands utility to even the tiniest parts imaginable. What a great vacuum lifting station this is! See the photos further down on this page. Unique, Handle Holder Integrated Into Center for Right or Left Handed Use. Pyramidal Holder Protects Delicate Suction Cups. One of 3/32", Two of 1/8", Two of 1/4", One of 3/8" & 1/2"
Continuous Chip Lifting. Instantaneous Chip Release. Ideal Under Microscopes! Small Chip Lifting Tips for 0805’s, 0603’s, 0402’s, 0201’s & 01005’s. See Chart Below for Sizes. Select Tip With OD Smaller Than Chip's X or Y. New! Extra Small Parts Tips! We've expanded the utility of the ZT-3 AirPick™ with our new ultra-precision tips for small parts or small component tips for the tiny 0805’s, 0603’s, 0402’s, 0201’s, and 01005’s. Completely ESD safe, our small component tips are available in “straight,” or “bent” designs. The bent tips provide best visibility for working with electronic chips. The Working End of the Tips are meticulously manufactured and are made with ESD-safe Delrin® providing a smooth and non-scratching "touch" to your small parts and chips. Working Under Microscopes while handling extra tiny parts just got a lot easier! We recommend the "Bent" Tip for all electronic chip work. De-Solder & Lift Chips Without Lifting Pads With LowMelt® De-Solder Wire! Non-Scratch Tips! Static Dissipative and ESD Safe. Working Temperatures to 212°F (100°C). ©1996 - 2011, 2012, 2013, 2014, 2015, 2016-2018, 2019 by Zephyrtronics®. All rights reserved. The information you receive online from Zephyrtronics® is protected by the copyright laws of the United States. The copyright laws prohibit any copying, redistributing, retransmitting, or repurposing of any copyright-protected material. Zephyrtronics is the registered trademark property of JTI, Inc. "The Science of Zephyrtronics" and "Simplicity Through Innovation" and "AirBath" and "AirPencil" and "AirPick" and "AirMill" and "Zephlux" and "Zero Balling" and "Zero Residue" and "Post Cooling" and "Post Cooler" and "AirBath" and "SolderGlide" and "SolderMill" and "ZeroTouch" and "Just So Superior" are the protected trademark property of JTI, Inc. Moreover, Zephyrtronics® and LowMelt® and ZeroLead® and AirFountain® and Fountainhead® are the protected and registered trademark properties of JTI Inc. The forenamed are federally registered trademarks with the Government of the United States of America. *The above names are the registered property of their respective owners.